1. Prepare the artichokes by removing all outer leaves and internal flower part, then peel the stalk. 2. In a large pan, add the vinegar, salt, 3 litres cold water and the juice of a lemon then allow to come to a boil. Add the artichokes and parsley. Lower the heat to medium and simmer between 6–10 minutes, or until cooked through. Remove the pan from the heat and allow the artichokes to cool in the liquid. 3. For the marinade: finely chop the parsley and mint. Place in a bowl and add the garlic, lemon juice and olive oil. 4. Once the artichokes are completely cool remove them from the liquid and place in the marinade. They can remain in the marinade for a few hours or overnight (in the fridge). When ready to grill, add the breadcrumbs and mix. 5. 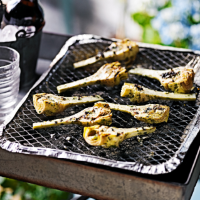 Grill the artichokes on the barbecue over a medium heat for 6-7 minutes or until coloured on all sides and heated through.